DELHI: Senior Sikh Channel reporter, Jaswinder Singh Khalsa was violently assaulted by security personnel in Delhi’s Mayapuri Industrial area on Saturday whilst reporting on the MDA sealing drive on factories in the area. 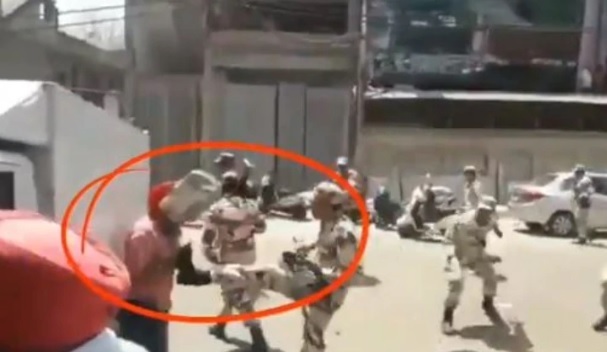 In shocking footage capturing the attack, Jaswinder Singh Khalsa was brutally kicked to the chest by a uniformed and armed officer whilst filming a Sikh Channel news report in Mayapuri. The sealing drive was started by the sub-divisional magistrate (SDM), Delhi Cantonment, along with the staff of the South Delhi Municipal Corporation (SDMC) and the Delhi Pollution Control Committee (DPCC) in the Mayapuri industrial area in pursuance of the National Green Tribual (NGT) order. 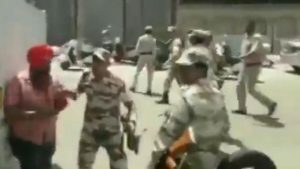 Whereas authorities claim that security officials took retaliatory action to bring the situation under control after coming under attack, commentators across social media platforms have remarked on how footage of the deplorable attack on a member of the press is testament to the excessive and indiscriminate force being utilised by members of the security personnel. Sikhs across the world have condemned the incident which coincided with the day when thousands have been commemorating the one hundredth anniversary of the Jallianwala Bagh massacre. The massacre took place in Amritsar on April 13, 1919, when troops of the British Indian Army under the command of Colonel Reginald Dyer opened fire at a crowd of people holding a pro-independence demonstration, leaving several dead and scores injured.